State level Maths Seminar on occasion of Mathematics day on 22nd December 2017(Teaching of Mathematics). TS SCERT is going to organize one day Mathematics Seminar on "Teaching of Mathematics for 21st Century" to Teacher Educators /Teachers and other field functionaries of School Education on 22nd December 2017 on birthday of Sri. 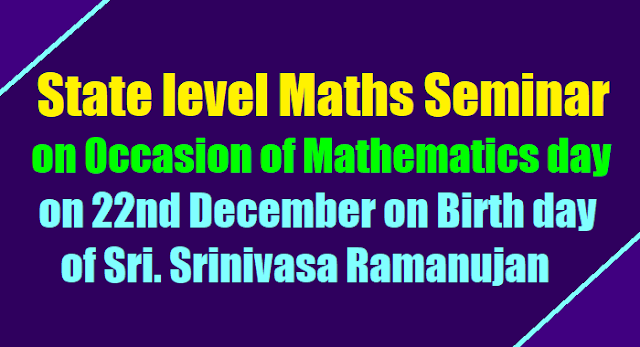 Srinivasa Ramanujan, i.e., Mathematics day on 22nd December. Guidelines on One(1) Day State level Seminar on the Teaching of Mathematics for 21st Century on 22nd December 2017. SCERT Telangana :: Rc.No.587, Dated:16-12-2017 :: Sub: SCERT, Telangana, Hyderabad - State Level Mathematics Seminar 2017 on 22.12.2017 at Regional Science Centre, Warangal - Reg. The SCERT, Telangana is organizing a State Level Mathematics Seminar on 'Teaching of Mathematics for 21st Century' to teacher educators/ teachers and other field functionaries of School Education on 22.12.2017 at Regional Science Centre, Warangal. The District Educational Officers of Warangal Rural and Warangal Urban are requested to depute 25 local teachers each to the said seminar to participate in the proceedings in the technical sessions being conducted in four sub-themes. • Developing problem posing, problem solving and creativity through Mathematics. • Role of Mathematics in Changing world. • Role of Mathematics in development of new technologies. Further instructions may be given to the deputed teachers to report the venue by 9.45 am on 22.12.2017 at Regional Science Centre, Warangal. The Principals of CTE, DIET Warangal and other teacher education colleges in Warangal Rural and Warangal Urban are requested to permit the mathematics teacher educators and teacher trainees to participate in the seminar and to report the venue by 9.45 am. The TA, DA will be paid only for the selected paper presenters. For others, attendance certificate will be issued. RESEARCH AND TRAINING, TELANGANA STATE, HYDERABAD. Sub:- SCERT, Telangana, Hyderabad - Deputation for selected teachers/teacher educators to participate in one day Mathematics Seminar on 22nd December, 2017 on the occasion of Mathematics day on 22nd December - Reg. Ref:- Rc.No. 587/N1-1/Sci/SCERT-TS/2016, Dt. 27-10-2017 of this office. The attention of all the District Educational Officers, Principals of IASEs, CTEs, DIETs, Teacher Education Colleges in the State are invited to the subject cited that SCERT is organizing one day Mathematics Seminar on "Teaching of Mathematics for 21st Century" to teacher Educators/ teachers and other field functionaries of school education on 22-12-2017 at Warangal on the occasion of Mathematics day. The exact venue will be intimated soon. • Development of problem posing, problem solving and creativity through Mathematics. The paper presenters may be instructed to prepare the PPT to highlight the contents of their paper and shall be handed over to seminar organizers in the form of soft copy and also requested to send the soft copies of the PPT to the mail ID tgscertmathsscience@gmail.com. The presenters should not exceed 10 minutes presentation and 2 min for interaction. The total times allotted for each presentation is maximum 12 minutes. The DEOs, Principals of IASEs, CTEs, DIETs, Teacher Education Colleges in the state are requested to depute the selected teacher educators/teachers on 22nd December 2017 by 9.30 A.M to present their papers at Warangal as per annexure. The TA/DA for the presenters will be borne by SCERT as per TSTA norms. The selected teachers/teacher educators of state level Mathematics Seminar are annexed with this order. Further the DEOs of Warangal (U & R) are requested to depute 40 Mathematics Teachers @20 Mathematics teachers from each district for witnessing the seminar apart from the candidates selected for seminar presentation. Further the Principals of CTE Warangal and DIET Warangal are also requested to send the teacher trainees to witness the seminar. 4 S. Sathyam, ZPHS Tekriyal, Kamareddy, 9490018908 Preparing the students (especially slow learners) to solve and create linear equations in one variable by using “MODELING METHOD”. SCERT Telangana, Rc.No.587, Dated:27-10-2017 :: Sub:- SCERT, Telangana, Hyderabad - Conduct of one day Mathematics Seminar at State level to Teacher Educators/Teachers and other field functionaries in the Sate - On 22nd December, 2017 on the occasion of Mathematics day on 22nd December - Reg. The attention of all the District Educational Officers, Principals of IASEs, CTEs, DIETs, Teacher Education Colleges in the State are invited to subject cited, SCERT is going to organize one day Mathematics Seminar on "Teaching of Mathematics for 21st Century" to Teacher Educators /Teachers and other field functionaries of School Education on 22nd December 2017 on birthday of Sri. Srinivasa Ramanujan, i.e., Mathematics day on 22nd December. The venue will be intimated soon. The District Educational Officers are requested to take the initiative to disseminate the information to all the schools in the District and encourage the Mathematics Teachers to send the write-ups in the prescribed format with in the stipulated time. In this connection a press note may be issued at the District level for wider dissemination of conduct of State Level Seminar. SCERT, Department of Mathematics and Science. Guidelines on 1 Day State level Seminar on the Teaching of Mathematics for 21st Century on 22nd December 2017. I. Theme of the Seminar: 'Teaching of Mathematics for 21st Century"
- To develop the creative thinking among the mathematics teachers. - To enable the teachers to relate the Mathematics to the 215' century needs. - To share and disseminate the innovative ideas in Teaching of Mathematics. III. Papers are invited From Mathematics Teachers, Teacher Educators, Researchers and the field functionaries working in the areas of School and Teacher Education. The contributors have to send their paper (write up) in English version or Telugu version in the following form on subthemes said above. • Last date for the submission of seminar papers (write-ups) along with soft copy is 20th November, 2017. • After screening of Seminar papers (write-ups) only, selected candidates will be invited to give their presentation on 22nd December, 2016. • Venue of the Seminar: will be intimated soon.